It’s confirmed. 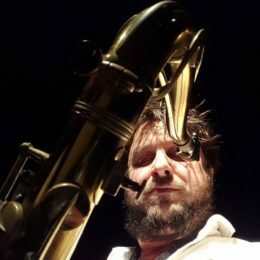 Stu Hunter is taking The Migration, a ten piece ensemble featuring some of Australia’s finest musicians, to Germany to participate in Jazzahead in Bremen in late April. I’m putting out feelers for other opportunities to play my own music and collaborate with local musicians in Europe between Easter and early May. Please contact info@julienwilson.com if you would like to make enquiries or suggestions. In the meantime, ARC, my new larger ensemble was launched during the last weekend of Melbourne’s premier jazz club, Bennetts Lane. Bennetts Lane will be re-opening in another venue mid 2017. ARC (the Autonomous Resilience Collective) is dedicated to celebrating music of struggle, resistance and revolution from around the world. ARC will have a different line up each time we perform but for the first concert it featured NY based British saxophonist Will Vinson, NY based drummer Rajiv Jayaweera, along with percussionist Javier Fredes, guitarist Craig Fermanis, electric bassist Chris Hale and pianist Sam Keevers. On a more traditional note, The Stretchropolitans are doing some shows round town, a relatively new quartet celbrating and stretching music from the early part of last century. The Stretchos are Sam Anning (bass) Craig Fermanis (guitar) Matt Jodrell (trumpet and myself on various tubes. The Transients Trio with Anning and Andrea Keller continues to do some shows around town. School’s nearly back. See you out there.